Friday night and you don’t know where to party? The roof of the city, on the 31 st floor in Basel you’ll find your answer. The most popular DJ’s in Switzerland will play the best music including 80's, 90's, Top40 Charts, House, Club/Disco Classics, Urban, RnB, and a lot more on the top floor of the Messe Tower in Basel. 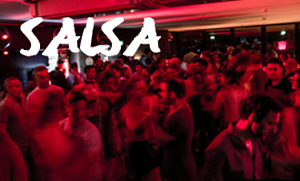 Our salsa DJ’s on the 30 th floor play the favorites of all dancers: Salsa, Bachata and Cha Cha Cha. Additionally, you will find THE BEST COCKTAILS in the city at Bar Rouge. Don’t miss it! Reserve a lounge in the attractive party package. Entrance: ladies 21+ y.o., gents 23+ y.o. Ab 22.00 Uhr: CHF 10.- und ab 35 Jahren gratis - Frauenbegleitung stets erwünscht!